"Ustaad" the title with which Shaheed Sibte Jaffar was affectionately and respectfully widely known as, for his decades-long association with the noble profession of teaching and for him being a towering sincere personality serving the cause of Ahlul Bayt(AS) with his verses and writings was an institution in himself beyond any doubt. His strong dynamism in serving millat immensely in multiple dimensions of arts, literature, education, social work, research scholar, looks like a miracle in itself. Perhaps, given his achievements it is not hard to believe what many of his friends say that he used to sleep for only two hours daily and spent time immersed with his works. amanaton mein na zenhar khurdburd karo! gham-e-Hussain, nayee nasl ke supurd karo! For the purpose he founded an institution "Idara e Tarweej e Soz Khwani" for formally teaching to younger generations Soz Khwani. He has left after him scores of hundreds of "Sibte Jaffars" particularly in the field of Soz Khwani the world over such was the magnitude of his popularity and teaching methodology. This is something very rare and speaks volumes of his sincerity for this noble cause of Azadari. He also compiled a 'basta' a collection of salaam, naat, soz, manqabat and other genre of urdu poetry mainly from two Stalwart Shia poets of Urdu literature, Meer Babbar Ali Anees and Meerza Salaamat Ali Dabeer some 15 years ago. The collection remains an adornment of nearly every Imambargah of Pakistan and nearly every Pakistan community run Imambargah / Hussainiah abroad. He was also part of Anjuman-e-Wazifa-e-Saadat to grant scholarships to various children who have now become contributing citizen of the beloved land. He visited Shaheed Foundation's inaugural program of Markaz-e-Asaar-e-Shohada back in Feb 2012 and his words still reverberate as if fresh, where he, in his trade mark lively and light style, predicted with a lot of conviction about his Shahadat. 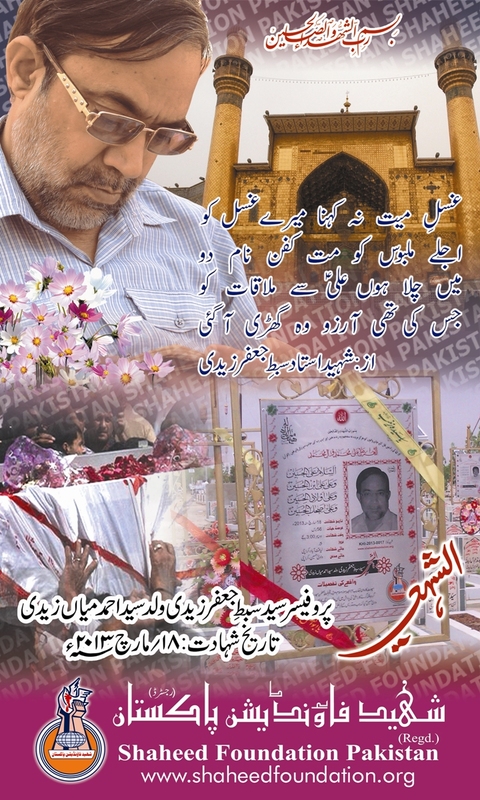 Ustaad Shaheed Sibt e Jafar Zaidi from Al Shaheed Productions. 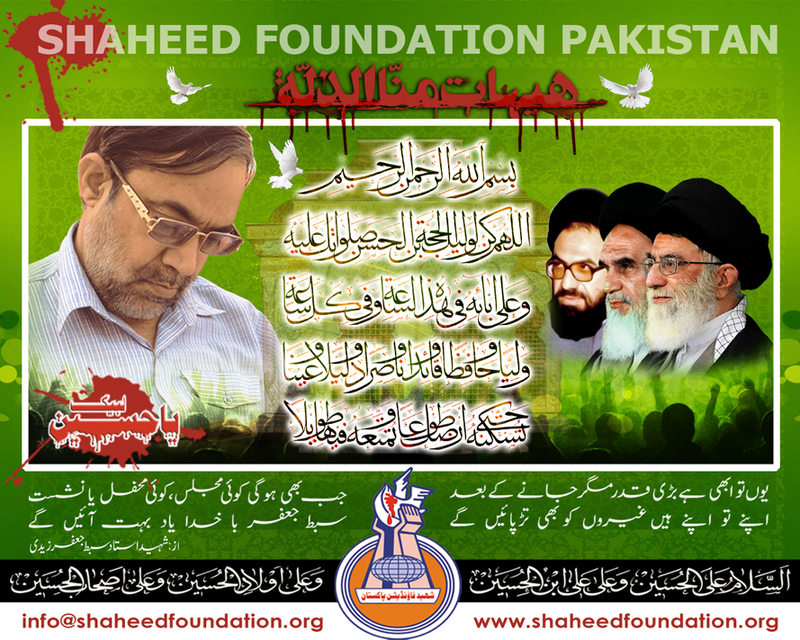 Recite a fateha for Shaheed Ustad sibte jafar zaidi and Shohada-e-Millat-e-Jaffaria Pakistan. Eminent Scholar, man of letters, poet and soz-khwan, social welfare activist, Professor Sibte Jaffar Zaidi embraced martyrdom in Karachi shortly, when yazidi terrorists sprayed him with a volley of bullets in Liaquatabad area of the megapolos. Shaheed was a qualified superior services graduate and was serving as a principal art one of the Government colleges [Government Degree Science College Liaquatabad] in the megapolis. 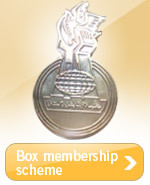 Shaheed was associated with the field of education since 1981. The professor a Grade 21 public officer who was about to be promoted used a 70 cc bike for his travelling, between college and home for earning livelihood and to Rizvia and Soldier Bazar where he routinely trained youngsters formally in Soz Khwani. The perpetrators were very well aware of his routine according to police investigators. They waited for him near Arshi chowk nearly half a kilometer away from the college and as he emerged on the intersection, one of the two attackers riding a motorbike, intercepted him and fired multiple shots. Police investigators discovered nearly half a dozen spent bullet casings of 9mm pistol a frequently used weapon in targetted killings in the megapolis. The news of his Shahadat spread like wild fire, although disciples and colleagues struggled to believe it as at least on two occassions earlier on during his worldly life, rumours of his shahadat had done rounds. Shaheed received multiple bullet shots. Only recently forensic experts traced the similarity in pattern of martyrdom of eminent Shia and Sunni scholars based on evidence from 80 high profile target killing cases in Karachi reported in some parts of the press earlier on.